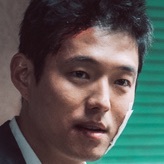 Jang Chen (Yoon Kye-Sang) came from China and now works as a loan shark in a seedy Chinatown area of Seoul. 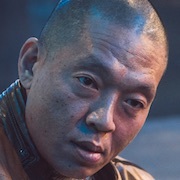 He's backed up by his bloodthirsty henchmen Wei Sung-Rak (Jin Seon-Kyu) and Yang-Tae (Kim Sung-Kyu). Jang Chen is beyond brutal in his methods to collect money. 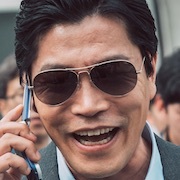 Meanwhile, Ma Suk-Do (Ma Dong-Seok) is a detective in the Chinatown area of Seoul. He tries to keep the peace, while two Chinese-Korean gangs battle over turf in the neighborhood. Jang Chen makes his move to take over. Filming began February 27, 2017. Based on the true story of the “Heuksapa Incident” in 2007. Detectives arrested 32 people who were part of a criminal ring. The group consisted of ethnic Koreans who came from Yanbian, China. Migthy Thor Sep 13 2018 4:24 am I am just so happy to have watched this movie! So marvelously FANTASTIC! I love the story , the fight scenes and the star studded cast! For those who like an action jam packed film, this is it! antique May 09 2018 11:41 am My top 5 BEST korean Movie 2017 for me.!!!! Constable Odo Apr 30 2018 7:09 pm Darn good movie. 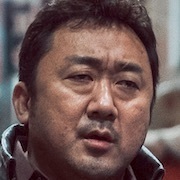 Ma Dong-Seok is a rock as a hard-as-nails detective. Definitely a violent film. I caught this on Amazon Prime Video and I'd say it's a "must see" if you like tough guy movies. I had a choice of various Korean movies and since this was rated rather high, I went for it. Glad I did. Lucy Apr 30 2018 3:24 am Bloody and violent. I enjoy a mostly male movie. Maybe I get my agression out on screen, so to speak. Well cast, slow at times, fast paced at others, suspenseful. I'll definitely check out the writers' and the director's other works. maria Feb 21 2018 3:30 am [RECOMMENDED] I wasnt expecting this movie too be so good!! 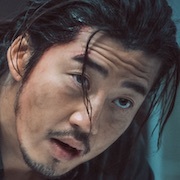 Yoon Kye Sang really did a good job as a handsome villain and Ma Dong Seokk wowowoowow his fighting skills in this really good! The suspense in this movie makes me so nervous n angry at the same tme. Good Job guys!!! Atlaw Jan 01 2018 12:39 pm Damn! I love yoon kye sang too much in this movie ? Goku Nov 19 2017 3:37 pm Great movie. Btw what name is do seung woo wife? Ki Oct 12 2017 10:24 am "The Outlaws" really surprised me ... as I expected a lower budget, cable TV quality action film. Umm nope. 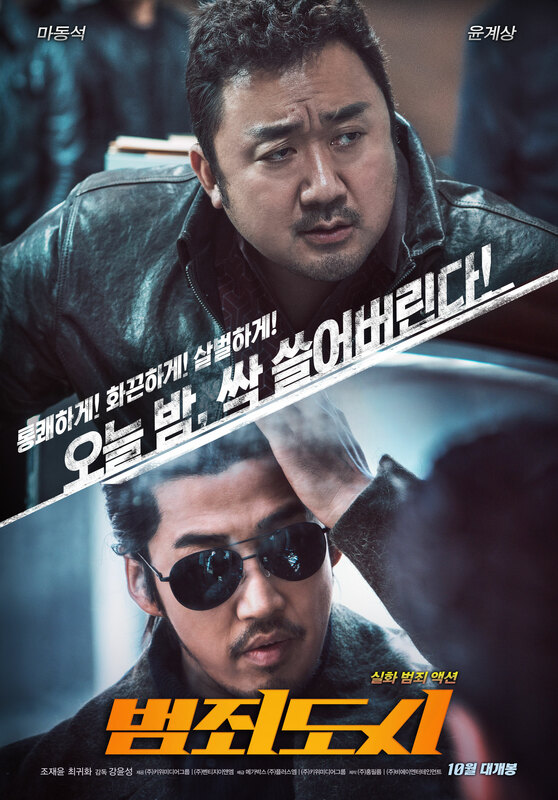 "The Outlaws" oozes out tension and just keeps building it up with a terrific screenplay and charismatic performances by Ma Dong-Seok and Yoon Kye-Sang. 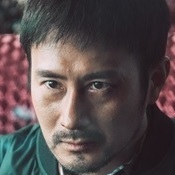 The screenplay features not only the duel between cop (Ma dong-Seok) and bad guy (Yoon Kye-Sang), but there's 3 other criminal groups that makes things even crazier and intense. If not the best Korean film of this year, "The Outlaws" is certainly the most EXCITING Korean film of the year. PatrickStar Oct 12 2017 9:54 am This film beat The Fortress in just one week screening, i've never expected this can be happened. 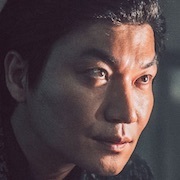 This film "just" starring by top supporting actor Ma Dong-seok (rising main actor) and Yoon Kye-sang who not make a hit film yet, with an underrated Director (new), beating The Fortress with some A-list actors, and big director Hwang Dong-hyuk (Miss Granny). How on the earth this can happened? People say this film was so interesting. So, absolutely this film will be on my list.